Komakiyama Castle, on top of Komakiyama, is located in the center of Nobi Plain which is itself situated in the center of Japan, and that the Castle played an important role in Japanese history. Two legendary warriors connected in the construction of Komakiyama Castle. The first warrior is Oda Nobunaga (1533~1582). He was born in Nagoya, and it’s no exaggeration to say that for better or worse he had one of the biggest impacts on Japanese history. His family hailed from at least one local warrior group in small Owari Province. Owari was the name of the current Nagoya area, which at that time included Komaki. having an incomparable genius not only for military matters but also for economical talent. He unified practically the whole of Japan in the 16th Century Warring States era. Thus, you can call Nobunaga the strongest real-life samurai in Japanese history. Even people from overseas will know the name of Nobunaga if they have studied just a little history of Japan. Nobunaga constructed this castle for the first time in 1563. here on the top of Mount Komaki. He constructed and was lord of many castles in his lifetime, moving from here to there to unify Japan; he equipped Komakiyama Castle with important facilities which can be said to be a historic turning point in the history of castles. Many Japanese and overseas people have an idea that the castles where samurai lived were constructed on a stone wall, right? But this was not actually true. Most of the typical castle towers, soaring gracefully on top of the beautifully built stone walls, such as Nagoya Castle, Osaka Castle, Himeji Castle and Kumamoto Castle, were constructed at the end of the 16 th Century to the beginning of the 17 th century. However, up to the middle of the 16 th century, when Oda Nobunaga constructed his castle on the top of Mt. Komaki, there were no large high- towered main keeps, called “donjon” or “Tenshukaku”, anywhere in Japan. At best there was some kind of fort that would play the role of lookout tower, constructed on top of an earthen mound. That was the style for the beginning of the Japanese castle. At the same time Oda Nobunaga constructed Komakiyama Castle, he designed a keep-like “Tenshukaku” structure atop the mountain and a stone wall. 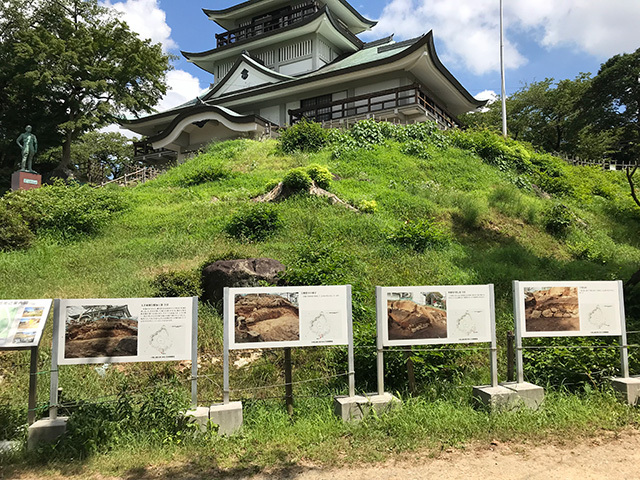 The structure looks poor in shape compared to the most famous castles in Japan as mentioned before, and unfortunately the roof tiles could not be found at any surrounding excavation sites. Still, the important thing is that they constructed a wall around the fort; as we would say “a continual succession of stones”. They assembled the stone wall using many stones carried up from the loca Iwasaki Mountain, or cut stone from large rocks around the top of Mt. Komaki. Furthermore, they put small stones instead of soil under the back of the large rocks and in the openings between other rocks to strengthen the wall. These small stones are called “back-filled stones”. In this way, the stone wall was so strong that it was remarkably prevented from falling or tumbling down, even if a natural disaster such as torrential rain caused by a severe rainy season, a typhoon in autumn, or an earthquake, which are peculiar to Japan, occurred. This stone wall was found to have three stories after more excavation works in the 21st century. This style will be shown to startling effect in the imaginative pictures later in this explanation. This Komakiyama castle was built by Nobunaga as the first castle lord. Beside the stone wall he constructed a long main straight road climbing up to the top of Mt. Komaki; we call it “Ote-michi”, and the main building of the top of mountain, which later became very symbolic building, we call “Tenshukaku”. They were all very epoch-making inventions. Another landmark was a functionally equipped castle town he constructed on the south side of Mt. Komaki. He built a full-scale castle very different from a medieval castle. Some fragments of broken “teabowls”, some building traces, and many small round stones used for the passageway of a high ranked residence were found under the top of Mt. Komaki in excavations in 2018 and reported in the TV news and newspapers. 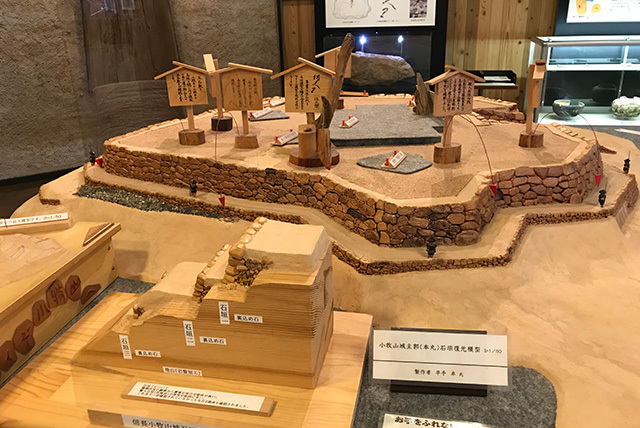 Due to these important finds discovered by the excavations, castle experts ranked Komakiyama Castle at the very lead of full-scale castle equipped with a stone wall and donjon with a surrounding castle town. Many castles were built in its image thereafter. Another key figure in Komaki Castle history is Tokugawa Ieyasu. He established the Edo Shogunate, which lasted about 300 years and led to a peaceful samurai era. Oda Nobunaga lived in Komaki castle for about four years, moving to neighboring Gifu castle in 1567, then built and moved into the famous Azuchi castle. At that time Tokugawa Ieyasu dominated Mikawa Province, which is the province next to Nobunaga’s Owari. Komaki City is in Owari province. but in 1582 he was killed by his retainer before he could do so. Toyotomi Hideyoshi, also his retainer, succeeded Oda Nobunaga and ruled over the whole of Japan, building the huge Osaka castle. battle then broke out in 1582. 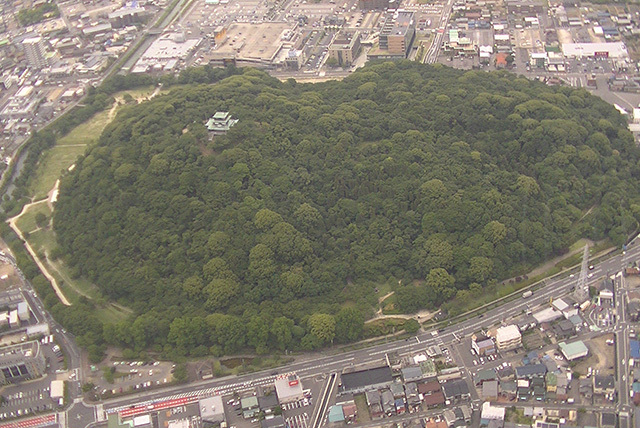 For this battle Ieyasu established his base on Mt. Komaki, while Hideyoshi based himself at Inuyama castle located on the north side of Komaki. The famous battle that ensued is called the Komaki-Nagakute Battle. For this battle Ieyasu fortified Mt. Komaki, for example digging moats around and in Mt. Komaki. It is supposed that he destroyed a castle tower and buried the stone walls Nobunaga made. You can still see the remains of the moats, but the stone walls are harder to catch a glimpse of. Archaeologists unearthed these stones, but after investigating they buried them again for conservation purposes. Now, a historical hall called Komakiyama Castle Historical Information Hall is being constructed on the foot of Mt. Komaki, due to open in 2019. Replicas of these stone walls are planned to be on display. Still, the tops of some real stones located on the left side and behind the foot of the historical museum can be seen, so please check them out. This historical museum was built modeled on a castle tower about 50 years ago by a donor. You can enjoy a panoramic view from the 4 th floor of this museum. Mt. Komaki was owned by the Owari Tokugawa clan and the public was prohibited from entering during the Edo Period. About 120 years ago the Owari Tokugawa clan donated this mountain to Komaki City. Because of this Mt. Komaki has retained its original state comparatively well, and many historical discoveries have been made there. There are a lot of flowers, birds, and insects around Mt. Komaki. You can enjoy them while walking or jogging on the promenades and lawn-lands. Other attractions spots are the main road to the south, the Inari shrine with its many red “torii” gates, and a rest area called Kannon Cave where the Mama Kannon temple was built before Nobunaga moved. On the hillside of Mt. Komaki there is a park called Cherry Riding Ground where you can enjoy a cherry blossom viewing festival from the end of March to the beginning of April. A torchlight Noh dance performance and a festival called Komaki Nobunaga Dream Night Festival are held in September at the historical park located on the east side of Mt. Komaki. We really hope you to enjoy Mt. Komaki’s nature, historical places, and events.